As those who practice the Cuyamungue Method know, our spirit journeys are received, gifts from beyond us. However, once we find ourselves in the landscape of the Alternate Reality (AR) we interact with it and the beings we meet there. This is receiving a vision from a larger source; it is not visualizing, projecting, or calling up in our minds what we want to see, valuable as those methods are. It is Paul’s and my particular joy to introduce novices to this work, as we did with this afternoon session in the Kiva at CI. Our instructions as to what to do inside the trance are simple: We are using other parts of our mind besides our intellect and “beta brain,” so we park the mental chatter off to the side. We allow our soul-self to receive the vision and engage in it. We find that not all that much instruction is needed; our body-mind-soul already knows how to do this. It happily takes the opportunity to do so, when allowed, and that primarily means getting out of our own way! We teach as Felicitas taught us. 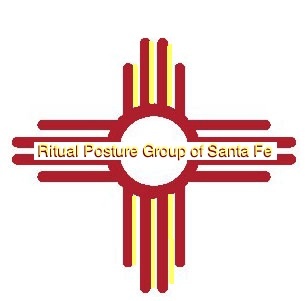 We simply set up the space and follow the ritual to allow access to that meeting ground — the AR — where our body-mind-soul can engage with this larger intelligence, what our ancestors called “the spirits.” We explain the components of the ritual so everyone feels comfortable with it, knows the what to expect, and the purpose of the steps. We then demonstrate the selected posture, without showing a photo of the original art work until afterwards, as some of the artworks carry clues to the experience. We don’t want to lead, or hint at or suggest content, we leave that to the spirits. And then with Paul conducting the ceremony and the rattling, its off to the AR we go, via the safe, easy, and very effective shift of physiology that allows us access. After the trance, as the rattling ends, our bodies take that cue to shift back again to functioning and tuning in to this daily reality. We take a few moments to do that, then we silently sit down with our journals to immediately record them, lest they evaporate back into the ethers as dreams do. And then one by one, we go around the circle to share our experiences. Laura Lee — My experience: I watch frigate birds flying in formation, over a wide, dry plain. Snakes slither across my feet, turning into vines that writhe and twist and pull me into the earth. The vines branch out in high speed, blossoming into a flowering mass of tree roots. I move up the tree’s trunk as it grows taller and taller, up into the clouds. In the uppermost branches, I flutter with the tender green leaves in the breeze, sending out an invitation. Birds come in response, settling into the branches. Chirping excitedly, they are bringing back messages. Then I see kelp anchored to the ocean floor, the long columns swaying and rising up like trees to the surface. I am in a tunnel, it is taking me up with the palpable sense of being in an elevator. It is a long winding blue column of energy, and I am inside, moving very fast. The tunnel is grooming me, dressing me in energy, aligning my molecules with elongated light waves. I am accelerating yet grounded. I feel up-currents of bliss, kundalini energy, rising in gentle, warm waves from toes to head. I stand still to let it wash over me, wave after wave. I am holding the corners of a large square of fabric. It billows up above me, catching the wind and carrying me up. A great being reaches out and takes me in its hand and jets off with me like a rocket. We reach the end of the tunnel, where energy is spurting forth like a fountain, arching gently all around me. The rattling comes to a close. AC:Powerful! Was not expecting this. A grandmother came, felt her presence. Lots of heat. Rocking. Water. Big green mountains. Waterfall that became rainbow light. Peacock array of feathers. Feeling of ascending, shaking, and a universal sense of comfort. Message “it’s ok”. LH:Shaking. Powerful, heat in beginning on left side. Saw light moving from left up to the right. Heard a flute over the rattle, very loud, and horses galloping by. Lots of energy. Became a tree swaying in the wind. Beautiful experience, feel gratitude. BE:Flashes of green leaves. Bear playing with a smaller bear, then consumes it. Eagle in sky. Bird diving, eats snake. Bear eats bird, consuming is shifting perspectives. Serpent eats bear, then takes her deep into the earth, tunneling. I am the snake, sunning herself on warm rocks, sitting at edge of cliff. A snake comes and bites my left wrist. another snake bites my throat, another snake is wrapping around me, coiling itself at my center. Heat that feels good, peaceful, bringing physical information. DD: I see tall grass. I am sitting on clouds, moving fast like time lapse. I hear footsteps behind, galloping. Tackled by a bear who wants to play. Has a noble voice, “Introducing you to my brothers, where you gather strength”. Cruising through deep water, heard whale sounds. Orcas. One says “This is why you listen to whales, mankind needs to learn our language.” Sitting atop a cliff at sunset, I take off flying, cruising low, with a bird who tells me, “If you draw from us, you will see different perspectives”. LK: I rarely gets visuals. More often, its through messages and energy. I saw lights, and felt a tremendous amount of energy, yet also a sense of grounding. PM: I felt movement, dancing. Saw light from lower left going up to the right. Felt a large feline presence, one I often see, and a band of wild horses running by. A lot of heat. Saw raven. Whole body reverberating. Felt the flow of the ocean, the rhythmic wave action, from waves to droplets. Saw a large phallus/arrow pointing straight up, like a sign. AF: Lots of energy, vibration. Hot, flush of heat. Tickle in third eye. Jumped up to the treetops. Rainbows shooting. Silhouette of Great Tree — opens arms up like broad wings. A whole tree world, sense of three levels, ladders connecting them, full of life, beings swinging on vines, activity all around. Lots of snakes. A cobra sat up and looked at me, circling. Light shot out the top of my head like a phallus/arrow. Heard “sperm, amoeba” with sense of primal, core-level death and rebirth. Cobra goes straight up, opens neck and turned into a white owl with wings spread. I am flying with the owl, observing the beautiful New Mexico landscape below. The owl drops me off at the Lion Circle. The lion lifts his head and winks and nods. I look up to see one white feather land in my hand. I feel we are the link between heaven and earth. I see energetic bubbles, energy swirls and pattern. I feel grateful, wonderful. RG: I feel the unmistakable shift into altered state, feel pulse rate rising. I couldn’t tell the difference between my heart beat and the rattle. Amazing amount of energy flowing inside. I felt before I saw a welling of information. Valley with long flowing grass. Horses running through. I am floating above, looking through the horses’ eyes, at canyon and rock. Then a cliff, ocean below. Tumbling into ocean. I hear, “I am ocean.” It becomes foamy with kale, leafy, an ocean of greenery. A tree grows out of middle of ocean. It draws water up into me, lines of green energy from the sacrum. kundalini ascending, sprouting into leaves, pinwheels spinning. Light coming up, spiral spinning getting brighter. It flashed and zoomed way out, with the growth of me as a tree. Higher level picture of the world growing itself. “I am the world that devours itself to nourish itself.” The sense of cycling, surrendering to something larger than itself. Heat, sweat running down my body. Hummingbird energy, humming, vibrating. — Heat! This is a surprise to those doing this for the first time — that such tremendous heat is generated, some to the point of perspiring. (and no, it was atmospheric heat) The interesting thing about the heat is how it comes and goes in waves, and to particular areas of the body. The vividness of the experience. Emotional Release, ending with a sense of gratitude, peace, well-being. Time Shifts: Many question if Paul was really rattling for fifteen minutes. The answer is yes, and he did not walk around the room! For some, it felt like five minutes, for others, eternity. Almost everyone comments that their journey concluded on its own, just before the rattling ended. Sound shifts: Many report they heard singing or a flute over the rattle. Some heard multiple rattles, the rattle move from place to place, the rattle come from a space within them, or no rattle at all. All of the above are indicators of being deep in trance, and common to all experiences with this method, we explain, and congratulations, you have successfully launched! We hear over and over how this was the most effective means for those who have tried other method of consciousness shifting. One woman said that as an energy healer, she is used to working with energy, but she was astounded at how much energy she felt during this process. The landscape had some commonalities: Tall grass blowing in the wind. Ocean, and ocean greenery. And, my favorite — the Tree of Life. This is not just a worldwide symbol, it seems to be the very architecture of the AR. Some aspect of the World Tree is reported over and over by people who know nothing of its significance in symbology. The lower world is its roots, the middle world its trunk, its branches the upper world. Again and again, we find this in our experiences and those of others. Movements of Energy and light: Rainbows and waterfalls of energy. Lights moving from lower left up to the right. Now here is the interesting part for me: a few people got verbal messages, which were underscored in the visuals and energy/light movements of others. Here, BE’s visual experience was of animals consuming each other in succession while RG heard the verbal message: “I am the world that is devouring itself to nourish itself.” In the big picture of the Web of Life, we see how true that is. Another verbal message was delivered to DD when the Orca whales told him he must learn to speak their language. AF’s verbal message was “we link heaven and earth.” And that message is underscored by the directional flow, if you will, of the experiences of others. Several of us, myself included, were first rooted, anchored, entwined and pulled deep into the earth. And then, we were catapulted into the upper world, the sky, the cosmos. This upwelling was repeated again and again with rich, colorful imagery. I was carried up from the Tree of Life’s root mass, up through the trunk to the tree tips, felt the uplift of long tubes of kelp growing up from the ocean floor, then shot up through an energy tunnel, like a wormhole, into the cosmos, to be grabbed then by a huge cosmic being. ?? Two others saw a phallus/arrow pointing the way –up. Others saw light or felt energy ascending, accelerating, expanding up and out rapidly, and rising up like a rocket. RG saw himself as the Tree of Life growing up out of ocean, and amid light pinwheels spinning and flashing, his perspective zoomed way out, and he saw a picture of the world growing itself. Who is the we, here, the I? Humankind, sentient life, life everywhere? Who is gifting us with these visions? Who can say, really? We can only say what it means to us. I was describing this adventure to a group who listened with interested curiosity at a recent dinner party. One woman shared her doubt that synchronocities in life mean anything other than random occurrences that we notice because we are tuned to do so. The example she gave was driving down the road with the vehicles like your own waving like red flags, you notice them because you are driving one vehicle; drive different vehicle and you notice those instead. Granted, synchronocities work on many levels, from the mundane to the profound. Brain-mind science tells us that we are wired for pattern recognition, it’s a survival mechanism, and helps us make sense of our world. I believe, too, that we are wired for story, for stringing words into sentences, and the incidents of our lives into a meaningful narrative — that too, helps us make sense of our world, and our lives in it. But must we chalk it all up to the mundane, when there seems to be such profound content imbedded in these synchonicities? “Learn our language: the web of life recycles itself so it may endure in endless cycles of birth and death….we link earth and heaven.” Sounds like a lesson worth learning, to me.